Last week marked the twentieth anniversary of Jack Granatstein’s provocative polemic Who Killed Canadian History, a book that laments the perceived steep decline in Canadians’ knowledge of our past. It is rare for any book to have such staying power. Earlier this month, for example, the book was drawn upon extensively in an op-ed column for my local paper, The London Free Press. In the column, history teacher Michael Zwaagstra warns about the dangers of historical thinking and how the growing influence of this inquiry-based pedagogy has eroded the teaching of historical content. Granatstein’s book and Zwaagstra’s op-ed column are polarizing. They force people to take sides in a debate that has mostly been unproductive. Either you are in favour of a strong chronological narrative about Canada or you focus on so-called marginal topics and – according to Zwaagstra – the development of historical thinking skills. 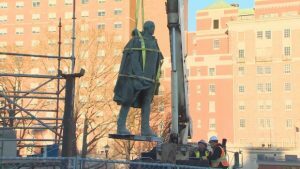 Nowhere is this clearer than in the recent debate over the legacy of Edward Cornwallis, the supposed founder of the city of Halifax, whose statue was removed from a downtown park earlier this year. Those who oppose the statue’s removal share the same arguments as those who emphasize teaching the past through historical narrative, chronology, and rote learning. The past is clear, they suggest: If we learn the facts, take all sides into consideration, we will inevitably conclude that Edward Cornwallis’s policies during the late 1740s and early 1750s were a function of his wartime context. France and Britain were continuously at war; as allies of France, Mi’kmaq were de facto British enemies; their decisions were driven by the interests of their European ally. Ignoring for a moment that Britain and France were not in fact at war in the early 1750s (though the Mi’kmaq and British were) this type of argument usually hinges on a limited set of scholars. Often absent is the important work of William C. Wicken and John G. Reid, two historians who were called as expert witnesses in the 1993 trial of Donald Marshall Junior; a Treaty Rights trial that hinged on the relationship between the Mi’kmaq, British and French during the 1750s. Using an argument that was later affirmed by the Supreme Court of Canada, Reid and Wicken demonstrated how the crown’s interpretation of the facts about eighteenth-century treaties unreasonably favoured written over oral and contextual evidence. Evaluating the past with greater attention to this oral and contextual evidence, the two historians argued, changes our historical understanding: the Mi’kmaq position in the region during the 1750s was far less dependent on European powers than Cornwallis’s champions suggest. What this example from Nova Scotia demonstrates is that recovering the past is not – in fact – as transparent as non-historians might think. Though facts about the past are important, historical thinking skills – such as determining historical significance or causes and consequences – condition the facts we select. Mastering these historical thinking skills allows us to meaningfully enter into civic and professional discussions about the nature of the past and the production of history. As a classroom tool, memorizing chronological facts does not adequately prepare students, or the public, to grapple with complex historical problems such as the meaning and legal implications of treaties or, in the example above, the legacy of Edward Cornwallis. The reality of the historical content versus historical thinking debate is that the lines are not nearly as rigid as pundits like Zwaagstra suggest. Historical thinking requires mastery of historical facts, narratives and arguments. We would be wise to set these divisions aside, entrenched as they are in Jack Granatstein’s twenty-year-old ideas, and move forward by recognizing that good historical thinking skills require deep knowledge and understanding of historical content. Lets stop killing Canadian history with these fruitless discussions about ranking ‘facts’ over ‘process.’ Instead, lets work to ensure that history as a discipline, and the skills required to think with history, occupy a more prominent place within our high school and university curricula. On this, I suspect, we can all agree. Thomas Peace is an assistant professor of Canadian History at Huron University College and an editor at ActiveHistory.ca. Special thanks to Tim Compeau, Lindsay Gibson, Carla Peck and John Reid for commenting on an earlier version of this essay. A very good posting. I read the op-ed piece in the London Free Press. It dredges up a very old debate and the same old straw man arguments that animated the first one with Granatstein twenty years ago. I’ve been teaching high school history for 16 years (as well as undergraduate history classes (I have a Ph.D. in history) and ABQ courses for history teachers looking to upgrade). The author is incorrect (and vague) when he says that “Many educators play down the need for students to memorize specific facts, particularly since information is widely available on the internet. Instead, they want students to focus on so-called historical thinking skills through thematic study.” I’ve had a few teachers in my ABQ classes use a thematic approach…the vast majority use a chronological approach. It is easier for young students to grasp, and most teachers recognize this. Also, the author of the op.ed doesn’t consider Ontario’s history curriculum (grades 7 to 12). It was re-organized a few years ago to explicitly take Sexias’ concepts of historical thinking into account (I think the curriculum didn’t go far enough…it left out “Understanding Ethical Dimensions of History”). It has also been structured chronologically. The Ontario curriculum prior to Sexias was organized thematically. I’m not sure what this says about the bad influence Sexias had on history curriculum. The ‘facts’ argument is a false argument. It laments the present (kids aren’t learning history),and then proceeds to reminisce about some mythical past when students learned ‘real’ history. The author of the op.ed is correct – a sense of chronology is important and facts do matter; however, he’s wrong to reduce history to such a simplistic formula.